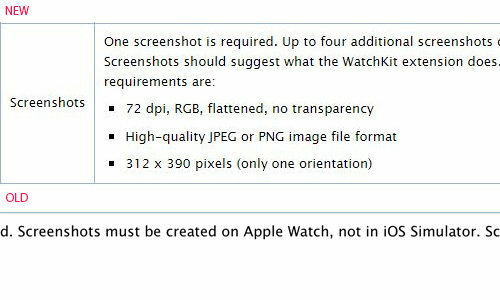 Apple has tweaked the requirements for Apple Watch app submissions, eliminating a problematic phrase which asked for a screenshot taken with a real Watch, not iOS Simulator, prior to the device's release. The change, visible in the official iTunes Connect Developer Guide, is believed to be a response to the concerns of developers. Prior to a March 13 update, the Apple Watch Properties section stated that "screenshots must be created on Apple Watch, not in iOS Simulator," as noted by developer Sahil Kumar on Twitter. Only a few developers have been granted hands-on time with the Watch prior to its April 24 launch, meaning that Apple's earlier screenshot policy would have blocked a majority of apps from even being submitted until that date. Apple is still not accepting any App Store submissions with WatchKit extensions. Developers will, however, be able to use screenshots from Xcode's iOS Simulator once the gates are open. Apple will likely have to begin accepting Watch apps within the next couple of weeks, since it can take up to two weeks for a submission to be approved. The Watch will need third-party app support to ensure its success, particularly given competing smartwatches such as the Pebble, and Android Wear devices, which may even be gaining iOS support. A variety of companies have been invited to Apple's Cupertino headquarters to accelerate app development. Some parties have included BMW, Facebook, and United Airlines.